The Mike Petersen / Dale White entry at Le Mans this year will be driven by Jorg Bergmeister, Nic Jonsson and Tracy Krohn, and will race in a revised livery – to be known as “Krohn-Green Lightning”. ‘This arrangement between the two racing operations gives Krohn Racing owner/driver Tracy Krohn a unique opportunity to race at Le Mans and, with key Krohn Racing staff in attendance, gain experience for future programs,’ says the team’s statement. “I am delighted to have been able to make this happen, and in a way that works for all who now make up this special team that we have brought together for the ACO’s centenary event,” says Tracy Krohn. 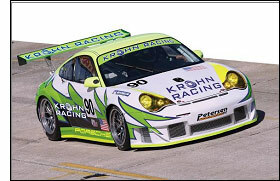 That certainly happened in 2003 and 2004, the Petersen-White Lightning entry then finishing second in class in 2005.